If you are publisher of content online, either as a newspaper, magazine or just a brand publishing a blog, you are likely to look at two measurements above any other. Those are "absolute unique visitors" and most popular content based on "unique page views." But those two numbers are pretty much the worst thing you can look at. While the data is useful for further exploration of your statistics, the numbers alone are likely to lead you down the wrong path. The knock-on impact of the decline [in print sales] has been a push for digital readers that have seen newspapers like the Daily Mail win five million unique visitors a day - compared with its printed sale of two million - but struggle to generate revenues to match. The reason digital is struggling is simple. "Unique visitors" is not comparable to "print readers". A print reader is a paying reader. A unique visitor is just anyone who happens to come across the website for any reason. Those are two completely different things. In this article we are going to debunk the myth of the unique visitors. We are going to take it apart and see if we can find the real valuable reader somewhere inside the data. How many of your unique visitors are actually real readers? And, how many of those are likely to buy your product (or buy a subscription)? As a result, all analytic services track unique visitors by setting a cookie that identifies one browser on one device and then assumes that equals one unique visitor. That might have been true in 1995, but today we live a widely different world. Because of the social world, we no longer think of "browsing the web" as an activity we do on a specific device. If someone shares a link with you on FB, you are not going to wait until you get home to click on it. You just use whatever browser, app and device you happen near at that moment. But this wrecks the old model for unique visitors. 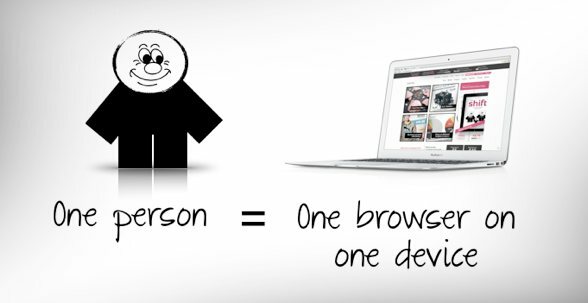 Instead of being one browser and one device for every person. It is now one person using any number of browsers on any number of devices.